Enabled port 3389 on my router and on my Windows 7 Firewall. added the following changes in Remmina - RDP protocol, Windows IP address (192.168.1.33), Windows Username, Windows Password and RDP Security under advanced tab. I even rm ~/freerdp/known_hosts even though there is nothing in that folder. Checked to see if I can ping my Windows 7 machine from Ubuntu and Vice Versa. I can ping these machines back and forth with no trouble. Even changed the security option under advanced to TLS as many have suggested online. Even enabled network discovery and file sharing on the Window as a last resort. Even after all that, Remmina on Unbuntu Laptop is REFUSING to connect to the Windows 7 machine. I simply don't know why. All Remmina says is "Connecting to "mywindow" for about 3 minutes. Then, it says Unable to connect to 192.168.1.33. That's it - no warning message box of sort. 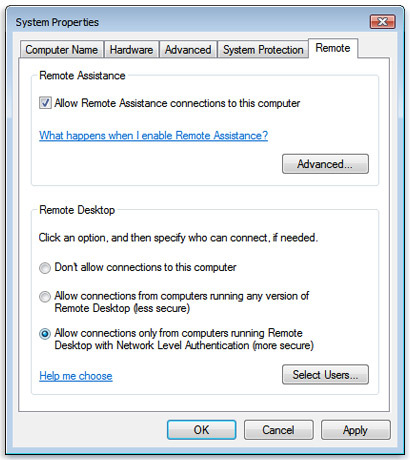 Additional information: On my Windows 7 window where you enable Remote Desktop Connection, there is only option to enable or disable remote desktop connection and it doesn't give you an option to select user. 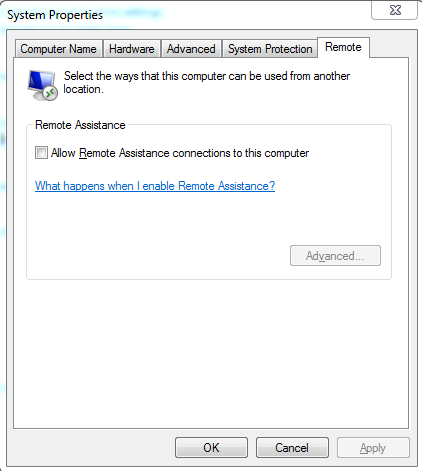 I temporarily disabled the remote desktop connection as shown on the picture. Your problem is that you don't have Remote Desktop on your Windows machine. You only have Remote Assistance, which is not the same thing. Here's an image of what that box looks like on a computer that is equipped with Remote Desktop. Your best bet, IMHO, is to download tightVNC onto this windows machine and connect to it using Remmina and the VNC protocol. Not the answer you're looking for? Browse other questions tagged networking server windows-7 remote-desktop remmina or ask your own question. How can I use remmina to connect to a Windows Server? Why can't I connect from Ubuntu laptop to a Win7 desktop thru Cisco AnyConnect? Why won't Remmina connect to Windows 10 Remote Desktop?